The lead test measures the lead blood level. A lead test measures the lead blood level. Why is a lead test important? The lead blood test is important for screening for abnormal lead levels. This Lead Test is a blood test. The lead test, also known as a lead lab test, lead poisoning test, and lead blood test, is a common screening test to check lead blood levels. Lead is a heavy metal that has several properties that have made it useful in industrial applications. Lead can be found in a variety of products such as paint as well food, water and contaminated air. Historically, more paint was made with ingredients containing lead and led to inadvertent lead exposure in children who put objects with paint particles on them in their mouths. Abnormal lead levels can occur from industrial, dietary or other exposures. The ZPP blood test is sometimes used in conjunction with the lead test to confirm lead toxicity is present. In situations of poisoning or toxicity, however, lead exposure can have a variety of negative effects on the body. Abnormal lead levels can interfere with normal functioning of many organs and, in particular, the nervous system. The nervous system is sensitive to lead levels in the body and poisoning can lead to headaches, tingling and memory loss in addition to stomach pain and long-term disability and infertility. Lead testing is sometimes performed at the same time as the mercury test. Lead blood testing is commonly used for screening purposes. Additionally, lead testing is also done after possible lead exposures resulting in a concern for lead poisoning or toxicity. Commonly, people wonder how long it takes to get lead blood test results. After the blood specimen is drawn at the lab, lead test results typically take 4 business days or less. To get a lead test near you, simply order online and get your blood drawn at your selected Quest Diagnostics lab location. 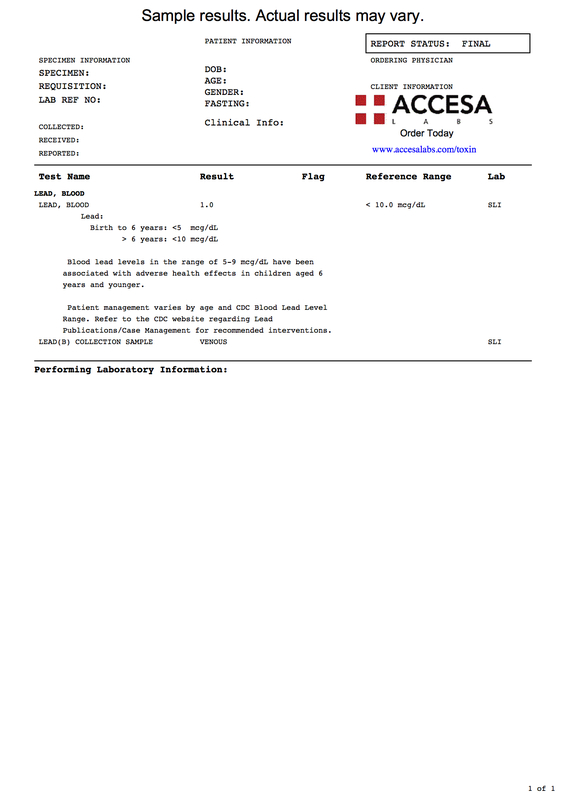 Once your lead lab results are ready, they will be available for download. As can be seen on the sample lead test lab report above, the results are reported as a number and can be compared against the reference range provided by the lab. Lead testing is part of a larger toxin screening panel known as the toxin panel test. The WHO indicates that 853,000 deaths were due to lead exposure in 2013 and identifies lead one of ten chemicals that should be treated as a major public health concern. Lead Test at Guaranteed Prices.